This week I'm sharing simple toddler activities with you as we move through the ABCs! 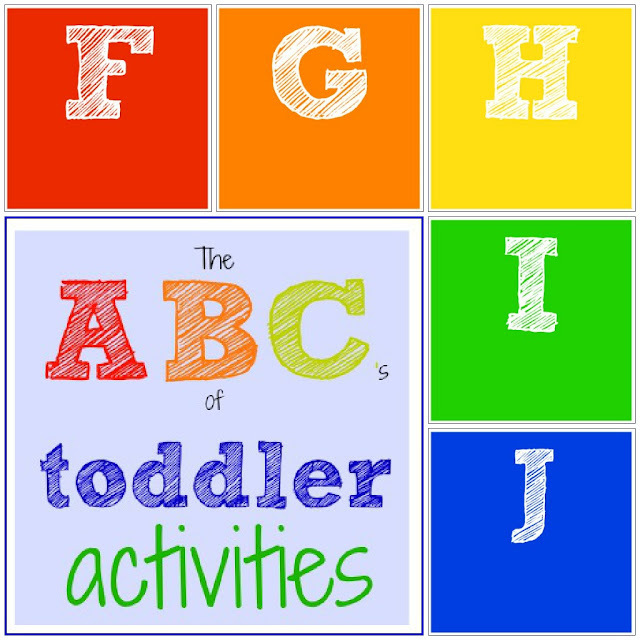 Today we're talking about activities starting with the letters F through J! (Yesterday we shared activities A-E, so check them out here if you missed them) Make sure to comment and share any other favorite toddler activities that start with these letters... since I am only sharing a few we like and there are SO many others I am missing! For our letter F activity, grab any favorite photos or leftover Holiday cards and start cutting them up! Laminate them or cover them with contact paper and then get ready to use them for a fun fishing for friends game! Materials Needed: photos, scissors, magnet, paper clips, contact paper, string/yarn, tape, and a tongue depressor. My toddler loves spending time with her friends and family, but is still trying to keep track of everyone's names. This fishing game (inspired by this one over at Make, Do and Friend) is a fun way to practice some hand-eye coordination while learning the names of family members and friends. All we did was laminate some Holiday card photos, tape a paper clip to the back (or just clip it on), and then use a homemade fishing rod to "fish" for the friends. We made our homemade fishing rod from some yarn tied to a tongue depressor, and an alphabet magnet (letter o). Our magnet wasn't super strong, but still worked. This activity would be even easier if you used actual magnets, but we just improvised and used what we had around the house. "Fishing" is definitely an activity that takes practice and patience. It was fun to say a friend's name and have my daughter hunt to find her friend and reel her photo in! 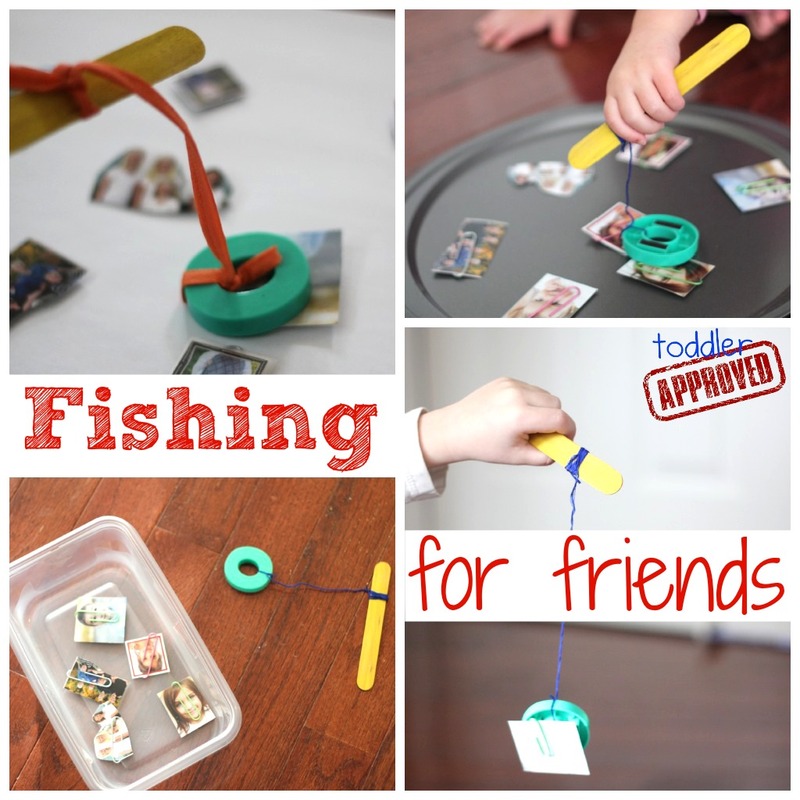 This fishing activity can easily be done with all sorts of other objects. Letter G stands for GOOP! Goop is created by mixing equal parts cornstarch with equal parts water. We used about 1 cup of water and 1 cup of cornstarch for each of my kids. Yesterday we chatted about goop over on our Facebook page and I learned that you can add baking soda too. Does anyone know what that does? We also mixed in a tiny bit of food coloring and did some color mixing. Make sure to mentally prepare yourself ahead of time that making goop will be messy! I absolutely love it, but when cornstarch starts flying on your table, it can be unnerving... so if you're not a huge fan of messes in your kitchen, this might be an activity to take outside or do in the garage. There are so many ways to play with goop! Growing a Jeweled Rose shared 25 different ways to play with goop just in case you need some more ideas. I want to try this goop and ice idea. 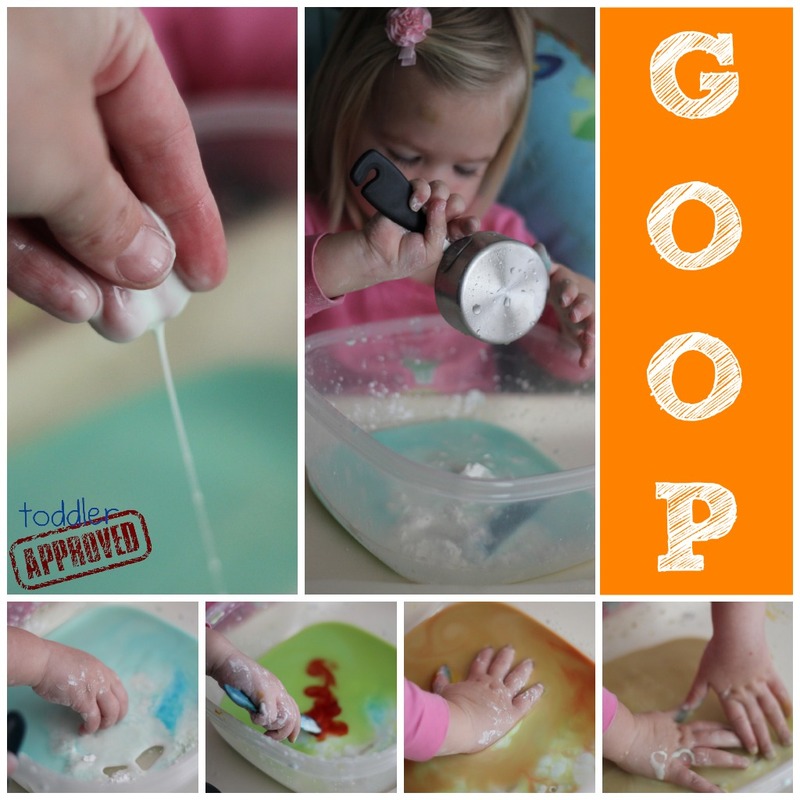 If we'd had time we also would've made gak... so if that's something you want to try, this post from Fit Kids Clubhouse called Goop vs. Gak is right up your alley. One of our absolute favorite toddler activities is hunting! We hunt for trucks and cars when we are driving and we love going on bug or mushroom hunts outside. Listed below are several of our favorite Toddler Approved hunts that we've shared over the past three years. A few of them even include simple printables that you can laminate and use. 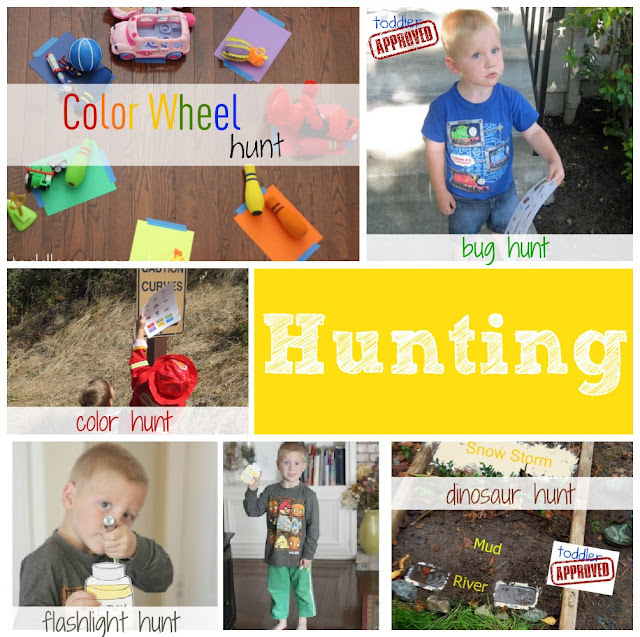 What does your toddler like to hunt for? Toddlers don't really need any extra help making noise... but I sure love helping them create even more by making homemade instruments! DIY baby container shakers- I set out bowls of materials (uncooked noodles, rice, and other random things) and some plastic baby food containers and let the kids fill them up. I sealed them shut, turned on some music, and the kids shook them and danced! Play-doh container mini drums- turn empty play-doh containers upside down, grab some popsicle drum sticks, turn on some music, and start drumming! Cereal box fiddles- all you need is a cereal box, paint, rubber bands, and some scissors. 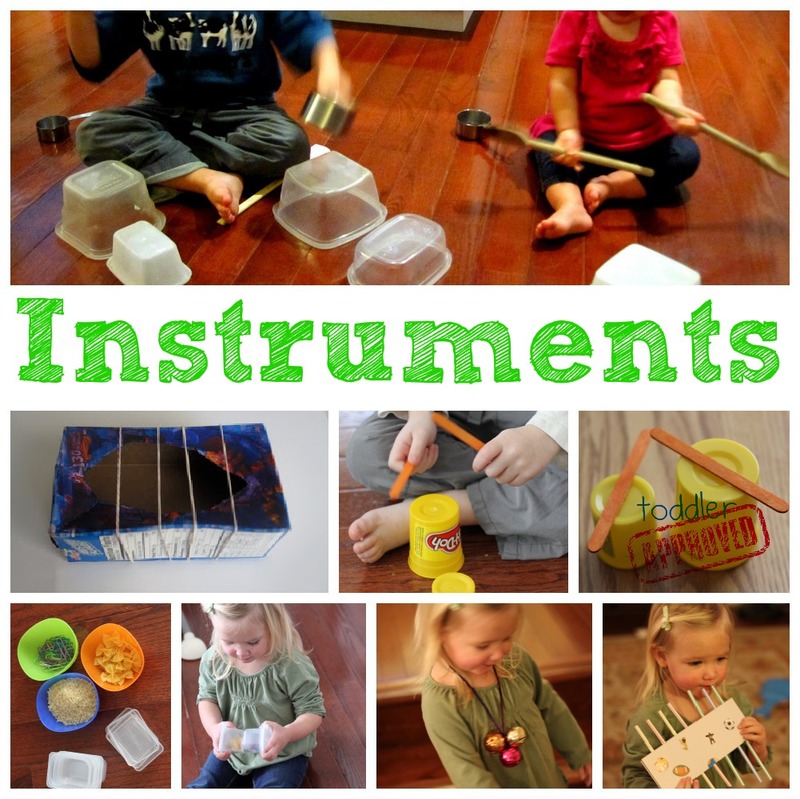 Wind Instrument Craft (inspired by Learning Ideas Grades K-8)- Grab some straws, heavy cardstock, some stickers (our favorite toddler crafting item), tape, and scissors. This wind instrument takes some practice using (you need to blow across the top of the straws, not into them)... but once your toddler figures it out, she will love it. Mine loved holding it as much as she did playing it. Jingle Bell necklace- string some large jungle bells on some yarn, tie it like a necklace, and shake it while you dance around! Our last letter for today is J for jumping!! Does your toddler like to jump? Ever since mine learned how to jump she has been doing it nonstop! My kids always want to jump on beds, jump on pillows, jump on the couch, etc. I love finding ways to channel that jumping energy off the furniture! 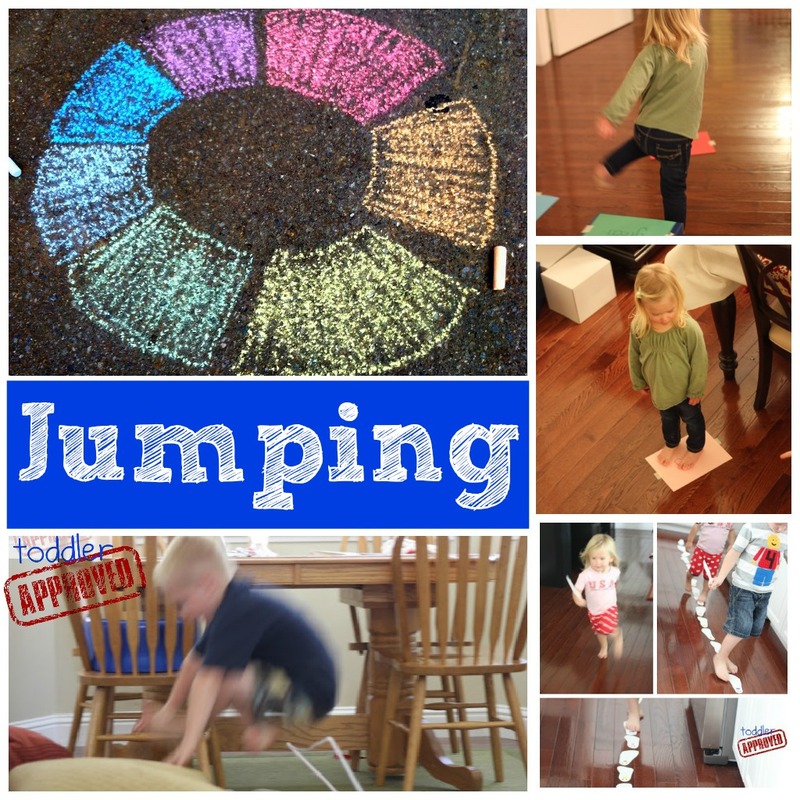 This year we've done a few jumping activities that were a lot of fun. Sidewalk Simon- My co-blogger EJ's awesome chalk version of a favorite childhood game. This game is so fun because you can jump while practicing colors, counting, and strengthening your memory! Footprint Jumping Game- Using some simple footprints you can create your own long jump! Straw High Jump- Grab some bendy straws, tape, and pillows and create a simple mini high jump that will keep your kids occupied for awhile... and get lots of energy out! This week we also created a simple color jumping game by sticking colored paper on our wood floor. I would say a color and my toddler would jump onto the correct color paper. Then I would say another color and she would jump from paper to paper to end up on the color I had called out. The game was super simple, but exhausting, and filled with lots of jumping! Do you have any other jumping games that you like to play with your toddler? I'd love to hear your other favorite toddler activities F-J, so add them in the comments and if you have a blog post link or photo, come share on our Facebook wall! Building a Home Library from Ready Set Read! Tomorrow I'll be sharing several more toddler activities. They will start with the letters K, L, M, N, and O! Thanks for stopping by! What an amazing post! So many great ideas all in one place :) Sharing this today. My toddler's favorite activity has always been messy/sensory play. With some shaving cream she shows me what messy play really means. Hopefully your S is for Toddler Sensory? Would love to see some toddler friendly sensory ideas. I love you how you shared your post! We need to do more hunting at my house. Such beautiful images you've created for each letter activity too! What a great resource of toddler activities! Lots of great ideas that I will be able to use with my little gang! It's great to have them here in this series to easily refer back to!